Hollyhock is a well-loved cottage garden plant but sadly it can be severely disfigured by hollyhock rust. Control is not easy. Hollyhock rust is caused by Puccinia malvacearum, a fungal disease of the foliage, spread by airborne spores. The disease will invariably develop on untreated hollyhocks, although it is worse during wet summer weather. Leaves, stems and calyx (outer part of the flower) can all be attacked. Heavy attacks stunt plants and reduce their vigour. Control of hollyhock rust is not easy, even when fungicides are used. Spores of the fungus can travel long distances, so will arrive continually from surrounding gardens and wild plants. The fungicides tebuconazole (Bayer Fungus Fighter Concentrate), tebuconazole with trifloxystrobin (Bayer Fungus Fighter Plus), and triticonazole (Scotts Fungus Clear Ultra and Scotts Fungus Clear Ultra Gun) are approved for the control of rust diseases on ornamental plants, and can be used against hollyhock rust. However, regular applications will be required - this could entail spraying twice a week when plants are in active growth, particularly if the weather is unsettled. 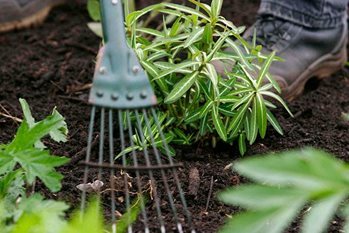 Protect plants as soon as new growth emerges in spring. The rust fungi are described as biotrophs; that is, they grow within the living tissues of the plant and extract nutrients from the cells. Although they do not kill tissues rapidly, heavy attacks by rusts can cause tissues to collapse and die prematurely and this is the case with hollyhock rust. The reddish-orange pustules on the leaf undersides contain numerous spores called teliospores that remain embedded within the leaf. Under humid conditions the teliospores germinate to produce a second spore type called a basidiospore. It is the production of the minute basidiospores that causes the pustules to turn an ash-grey colour, and it is these spores that are carried in air currents to create new infections when they land on other hollyhock leaves. Infection is favoured by wet or humid conditions. The disease is therefore most problematic during wet summers, but it is so aggressive that plants are invariably affected even in dry years. The fungus overwinters on the few green leaves remaining at the base of hollyhocks and perennial mallows, and may also survive within the crown of the plant. New leaves emerging in spring soon produce rust pustules. The fungus has not been found within the embryo of hollyhock seeds, but the seed could still carry infection in the form of spores on accompanying bracts or flower parts. Like many rust diseases, hollyhock rust has a ‘latent period’, when infection of the plant has occurred but symptoms are not yet visible. Depending on environmental conditions this latent period can range from a few days to several weeks. It is therefore possible that bought-in plants could be harbouring the disease. Plants grown on nurseries are often treated with fungicides, which may suppress the fungus without killing it. Susceptibility: In addition to hollyhocks, the rust can also affect a number of other plants in the Malvaceae family, including Abutilon, Hibiscus, Lavatera, Malvastrum and Sidalcea. It affects common mallow (Malva sylvestris), a native perennial found frequently on roadsides and waste places (particularly in England and Wales) and sometimes grown as part of a wildflower meadow.